Emiratis will no longer need a visa to travel to Mexico after the Central American country removed visa requirements. An agreement signed this week between the two countries exempt citizens of both countries with regular UAE and Mexican passports from visa requirements. UAE ambassador to Mexico Ahmed Hatem Al Menhali signed the agreement on behalf of his country. The Central American country was represented by Carlos de Icaza, the Mexican undersecretary for the Ministry of Foreign Affairs and International Cooperation. The announcement comes less than a month after Dubai carrier Emirates said it was scrapping a route to Mexico via Barcelona after it was unable to get permission to operate the service daily. Several countries including Canada and Ireland have also this year removed visa restriction for citizens of the Gulf country. 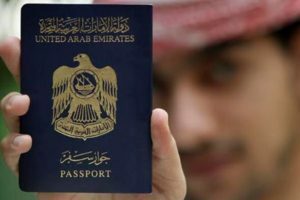 The UAE passport has become the most powerful in the Middle East according to Henley & Partners’ Passport Index. The recent edition of the global ranking for countries’ passports, last month ranked the Emirati passport 21st. It was ranked 62nd in 2006. Written by: Peter Mulvany on October 17, 2018. Last revised by: Jaber Ali, our reviewer, on October 18, 2018. Posted by Peter Mulvany on Oct 17 2018. Filed under Gulf News, Headlines, World News. You can follow any responses to this entry through the RSS 2.0. Both comments and pings are currently closed.